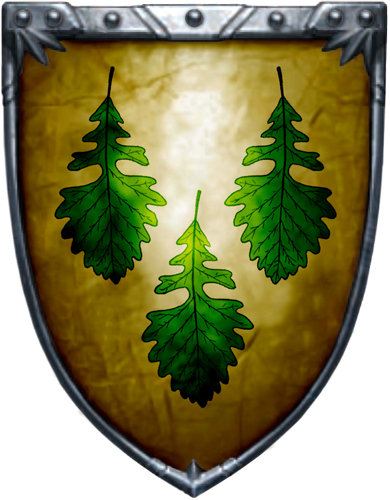 House Oakheart of Old Oak is an old and powerful family from Old Oak in the Reach. They are among the noble houses from the Reach that can trace their descent from Garth Greenhand. As part of the longstanding rivalry between the Reach and Dorne, Oakhearts have fought Dornishmen extensively. They are loyal bannermen to House Tyrell, and have intermarried with the Tyrells several times. Most notably, Jeyne Tyrell marrying the current Lord of Old Oak, Ser Eldan. As such they enjoy some favourable outlook from Highgarden. Elton Oakheart - knight, heir of Old Oak a man in his middling years. Ser Quillian Oakheart - knight, known as the Blackrood or "Black Root". Infamous for his raids on the Dornish borders, and most recently his killing of Ser Osric Dayne The Sword of the Morning. Lady Johanna Oakheart - youngest daughter of Lord Eldan and Lady Jeyne. These characters bear the House's name, either by birth or by marriage. These characters are a part of the House but do not bear the House's name. These include wards/hostages, sworn swords, house maesters, and other servants. These characters are tied to the House by blood but not by name. These include ladies who were born to the House but have married into another and any children they might have, as well as bastards who are not a part of the household. House Targaryen - As loyal bannermen of House Tyrell, House Oakheart recognizes the ruling House of Westeros as their kings. Though, recently there has said to be some tension between members of both houses living in Oldtown. House Tyrell - Liege Lords. The Oakhearts enjoy a good relationship with the rulers of Highgarden. House Florent - House Florent, and House Oakheart have enjoyed a good relationship, and often times have aided one another in various capacities. House Cockshaw - House Cockshaw are seen as allies and friends. Ser Quillian is said to have been oath-bonded to Ser Viggo Cockshaw. House Oakheart, also moved to act in retribution over the Wickham's Nest Massacre. House Oakheart does not get along with any of the Dornish houses. Most notably House Blackmont and House Oakheart have been in a feud, which up until recently has kept itself quiet.